When I first started on my weight loss journey, I learned to eat three meals and three snacks each day. This made it much easier to last between eating times. It seems as though I have a good, healthy meal and before long, it’s time for a snack. During this busy season I put several snacks in a cooler with water, and then I am prepared for the last-minute decision to stay and shop. This has saved several pounds, and I am not tempted to stop at the fast food place because I am prepared and ready to go with nutritious snacks. A recent houseguest once said, “You really enjoy what you eat!” She’s right. By planning nutritious and delicious meals and snacks ahead of time, I can sit back and enjoy my food in the healthy body that has resulted from making good food choices. 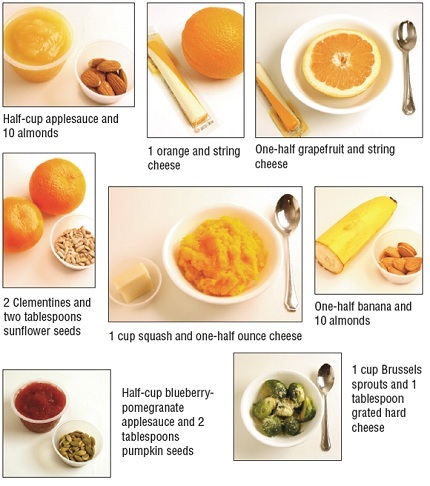 Healthy snacks should contain around 150 calories. They give your body the energy it needs so you don’t get too hungry and reach for the wrong foods, or overeat at the next meal. Dried fruit and nuts have been one of my favorite snacks that I can prepare ahead and enjoy at home, running errands or traveling. You can also have a small amount of dark chocolate. To make this snack I will use equal parts of dried fruit, nuts, and dark chocolate. I mix them in a large bowl and then measure ¼ cup of the mixture and put it into a zip top bag and I am set. Here are several healthy snacks that I enjoy. Dian has just finished a new book titled Tipping the Scales in Your Favor. View Dian’s weight loss journey on a new video by BYU and get her new book. Order on line at www.dianthomas.com. Books are also available in the Utah Costco Stores and Deseret Book Stores and other LDS Bookstore. Also check your local bookstore. Book Special: It has been 40 years since Dian started her business which lead to an appearance on the NBC Tonight Show with Johnny Carson. Right now she has a special on her five books (sold over a million copies) and one video for the blockbuster price of $40.00 (regular price is $95.00). Go to www.dianthomas.com to take advantage of this limited offer.